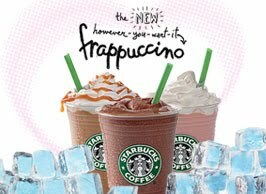 Now Starbucks is letting you can customize your very own Frappuccino® blended beverage. How will you express your love for this sweet indulgence? The possibilities are nearly endless - and the choice is all yours. Plus, it's now Happy Hour at Starbucks! Try a Frappuccino your way for Half-Price from 3-5pm! (until May 16, 2010). Here are some of the choices to customize your drink. Will it be nonfat, 2%, whole or soy? Extra coffee? A shot of espresso? Decaf perhaps? A little drizzle? Chocolaty chips? Whipped cream? To check it out, visit your local Starbucks or frappuccino.com.